MEDILIGHT, a collaborative project on developing a smart, self-adaptable system, which will provide personalized light therapy to patients with chronic wounds, coordinated by the Technical University of Berlin (TUB), and co-funded from the European Union’s Horizon 2020 research and innovation programme, was featured last week by professor Norbert Gretz of the University of Heidelberg and his team on the German RNF TV. Watch the TV spot on MEDILIGHT cover webpage. On 25 – 29 June, 2016, a joint event with The International Society on Olfaction and Chemical Sensing (ISOCS) and the European Commission was be organised, focussing the attention on Sensing for the emerging world of “Smart Anything Everywhere”. MNBS Workshop 2016 (Micro-Nano-Bio Convergence Systems) was be held on the 27 and 28 of June 2016 together with the ISOCS-MiNaB-ICT event in Otranto (Lecce), Italy. The MEDILIGHT project participated in the projects innovation session titeled “MNBS enabling bio-medicine & health”, in which Dr. Dionysios Manessis of the Technical University Berlin delivered a presentation “Medilight- Miniaturized smart system for light stimulation and monitoring of wound healing”. Click HERE to see the slides. MEDILIGHT consortium held a two day meeting (20 – 21 June 2016), which took place in Prague. Project developments and progress during the first half of the projects were discussed. Packages overview was presented and steps for the coming months were planned. Technical workshops were held during both first and second day of the meeting. As the consortium is very much aware of the importance of a continuous dissemination during the project lifetime, a workshop focused only on project dissemination took place. The other workshops held were of a technical nature: LED foil&electronic module design, sensors&interfaces, patch design, and light scheme scenarios. MEDILIGHT External Advisory Board convened during the meeting. For photos, please see the Gallery section. This year’s edition of SPIE Photonics West conference in San Francisco was held from 13 to 18 February 2016. Every year over 20,000 people come to SPIE Photonics West to see, learn about, and purchase the latest devices, components, and systems that are enabling, and driving, today’s trends: state-of-the art medical technologies, the Internet of Things, smart manufacturing, autonomous vehicles, and more. CSEM submitted an abstract for a presentation which was accepted. Presentation titled “Wearable light management system for light stimulated healing of large area chronic wounds” in which MEDILIGHT project and its results were presented was scheduled for 13 February 2016 and was given by Rolando Ferrini from CSEM. The slides are available here. European Photonics Industry Consortium (EPIC) organized a technology workshop focused on Biophotonics in Berlin on 26 and 27 November 2015. The Symposium was split into 4 sessions: Session 1: Photonics-enabled in-vivo Imaging and Spectroscopy in Oncology; Session 2: Match light engines features with biophotonics requirement; Session 3: Towards Higher-content with Photonics; and Session 4: Future Trends in Photonics. In session 2 as part of the Topic 3: Integrated schemes for light transport and diffusion, David Kallweit from CSEM gave a presentation titled “Light stimulated healing of chronic wounds by use of optical waveguides and light management microstructures” in which MEDILIGHT project and its results were presented. The slides are available here. The detailed programme of the event is available here. 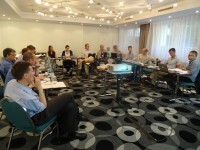 MEDILIGHT consortium met for a two-day meeting from 30 June to 1 July 2015 in Basel, Switzerland in order to discuss the progress made in the first 6 months of the project. Work Packages overview was presented and steps for the coming months were planned. Two technical workshops were held the second day of the meeting. One was focused on the first test vehicle development to be presented at the review meeting at the European Commission. External Advisory Board members also took part in the meeting and the consortium appreciated their relevant inputs. 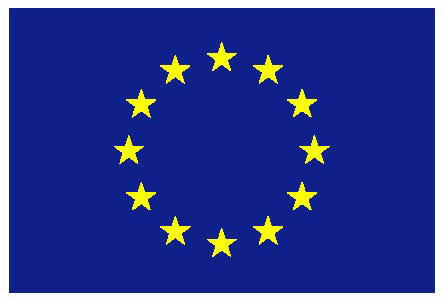 Next meeting will be the M9 (month 9) review meeting in Brussels. Some photos from the meeting are available in the Gallery section of the website. MEDILIGHT consortium released its first press release in order to inform broad public about the launch of the project and its promising objectives. You can find basic information on the concept in there, too. 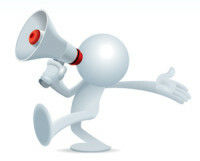 It is available here or in the website section Publications & Media – Press releases. 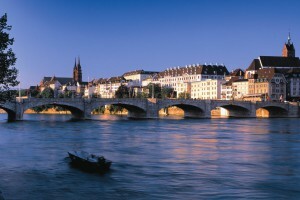 The second meeting (M6 meeting) of the MEDILIGHT consortium will take place from 30 June to 1 July 2015 in CSEM premises in Basel, Switzerland and CSEM organizes it. The aim of the biannual meeting is to discuss and sum up the progress within the first six months of the project, to have a debate on issues that might arise and to plan next steps to follow the project’s timing. 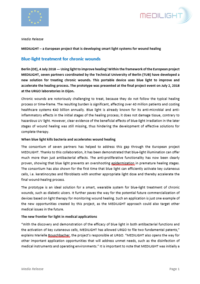 MEDILIGHT (Miniaturized smart system for light stimulation and monitoring of wound healing) is a three-year Horizon 2020 project in the area of smart system integration focused on a medical device for professional wound care which will use therapeutic effects of visible light. The consortium consists of 7 European partners and it is being coordinated by the Technical University of Berlin (TUB). 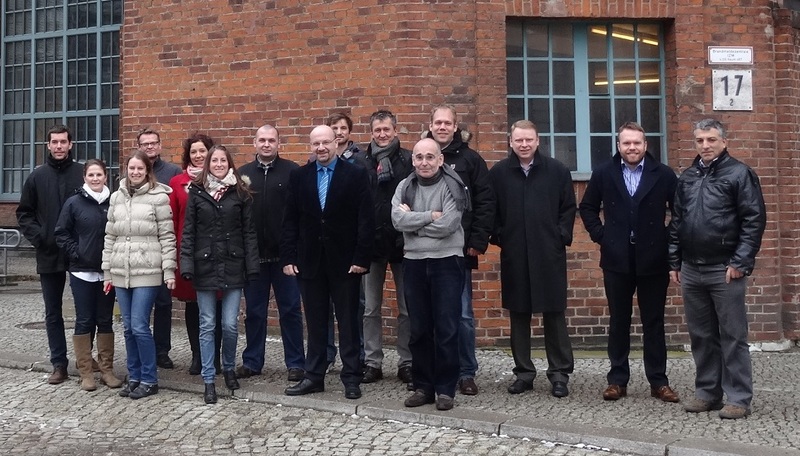 Project started on 1 February 2015 and the kick-off meeting took place on 3 and 4 February 2015 in Berlin, Germany where all partners met to discuss and plan first steps and actions.